The latest video from William Hughes Ltd features the passivation process facility based at the Company’s headquarters in Stalbridge, Dorset. NADCAP accredited and Honeywell Aerospace approved; the video explains how passivation can be used to remove exogenous iron or iron compounds left behind on the surface of stainless steel as a result of machining and fabrication processes. The William Hughes passivation plant is fully automated and PLC controlled, offering novel functionality in that once the component basket is placed in position, there is no manual ‘dunking’ of components from station-to-station, as with traditional systems. Instead the plant performs 'fluid transfer', moving chemical solutions from holding tanks into the main processing unit as required. This prevents damage to the parts involved as they are not required to move. 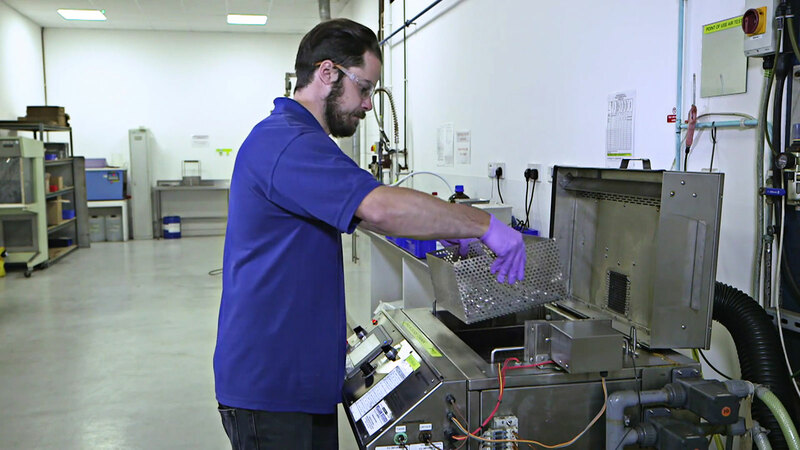 Typical treatments feature nitric acid/sodium dichromate and rinse cycles followed by a further rinse in deionised water before the parts are placed in a drying cell. The in-house passivation plant demonstrated on a new William Hughes video.